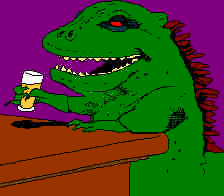 BeerMonster is a friendly enough reptlie. All he does is sit in his local ("The Railway") all day and drink. He drinks beer, of course. He's quite an intellectual for a permanently pissed giant lizard with glowing red eyes. As another manifestation of excessive alcohol intake, Flying Purple People Eater gets on well with BeerMonster. As part of a healthy-eating drive, he no longer actually eats people, and instead sticks to things like pizza and curry - sometimes at the same time. 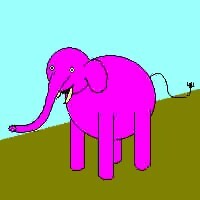 Now rather old and tired, Pink Elephant likes to relax and not get involved too much. He's a bit of a reminiscer, and will bore people to death with drinking stories of times gone by if you give him half a chance. His size makes him handy in a fight, still. Gustav is one of the regular bar staff at "The Railway". He's a German student studying Hospitality Management at a local college, and working behind a bar not only gets him money, it also gets him "valuable career experience". Or that's what the course leader says, anyway. Joy is another of the regular bar staff at "The Railway". She's perhaps rather more sensible (not to mention grounded in reality) than many of the customers - but that isn't exactly hard.